Why Billboards with Coast Outdoor? Billboards are relatively low cost. Every advertiser, from Apple computer to a fine non-profit community support organization like The Mustard Seed, needs to see value for money and wants to know that their advertising budget, big or small, is well spent. Billboards offer a relatively low cost and effective solution for getting the word out. Best of all, you can't switch the channel, click away from or turn the page on a billboard ad. Coast Outdoor Advertising has its played its role in helping hundreds of businesses and organizations reach their advertising goals since 1975. 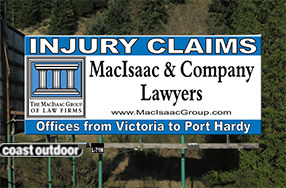 For advertisers like The MacIsaac Group, who made the decision to go big and add billboards to their marketing mix, billboards are effective and can become an integral part of a company's brand strategy. Year after year, new potential clients get the message from billboards. They work as hard as you do. Billboards offer serious reach and frequency. How many people see a billboard campaign while its in the air working for you is called the campaign's "reach". Even a smaller billboard campaign can have a reach in the millions. That means your billboard ad can effectively deliver your message millions of times. "Frequency" measures how often on average an individual in the market you've targeted will see the billboard ad. It may take more than one ad view for a potential customer or client to act on your billboard ad's call to action. Billboards offer terrific frequency. Coast Outdoor Advertising is local. We're from Vancouver Island. Ask around about us. We know our market and the lay of the land. We respect and support our First Nation partners as well as the local communities where we do business.